With the heavy work of lifting and securing the boiler having been done in the previous two years, we went back this year to monitor how well the boiler remained secured to the bottom. Other goals for this year’s project were to search for the firebox door, return it to the boiler, locate the mooring block and put a chain on it for mooring, and search for other sections of the wreck that have not been documented. The Project crew included the familiar faces of Tim Pranke, Phil Kerber, Jim Christenson, Corey Daniel, and Jack Decker. New comer Mike Mack joined us. The proper permits for diving on this historic wreck were procured through the Wisconsin Historical Society (WHS) back in April. The Float Plan was filed with Silver Bay Marina just prior to departure. The R/V Preservation cruised out of Silver Bay Marina Thursday morning, August 2, on an Easterly heading across Lake Superior to Outer Island. The Pretoria lies about a mile and a half North of Outer Island and just outside of the Apostle Islands National Lakeshore boundary (hence the permit from the WHS.) We arrived at the wreck and splashed the first divers at about 4:00 PM. The boiler was still attached to the bottom. The chains were as tight as when we put them on, last summer. Dives the second day found the mooring block and chocks. 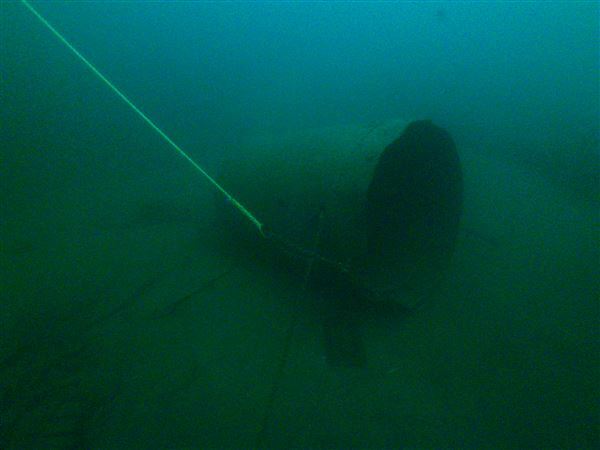 The chocks are from a previous attempt (by other divers) to secure the boiler. A chain was secured around the mooring block for future mooring. On the third day, Saturday, August 4, divers found the firebox door, at the edge of the wreck near the mooring block, and moved it to the boiler. It was test fit to the boiler to verify it was indeed the firebox door. It fit, but, was a bit flattened. Most likely, the flattening came from being rolled on by the boiler, while still attached to the boiler. Dives the fourth day searched west and north of the stern. Some scratch marks on the bottom indicated wreckage might have been pushed this way. A measurement was taken of the length of the undocumented section of the port hull section north of the wreck. Based on scaled dimensions from the official documented drawings, this measurement, and knowing the actual length of the ship, an 80 foot (approximately) section of the ship is still missing. The final day, Sunday, August 5, was the only day we were weathered off the wreck, by an approaching thunderstorm. We cruised the R/V Preservation around the NE corner of Outer Island to a very scenic and rocky shore, out of the weather. The water was clear and coldly inviting. So, we went swimming. The storm had moved on after lunch and diving on the wreck commenced. The dives were spent searching north and west of the stern for other missing sections. In the process, Tim found what we believe to be part of the hydraulic steering mechanism. In all, we performed 27 dives for a total of over 24 hours of dive time. The weather was terrific, as we were able to stay every night at Outer Island Lighthouse. A campfire one night and beautiful stars every night. The securement is holding, the firebox door returned to the boiler and more wreck is still to be found and documented. For more information please contact us at info@glsps.org.